I have been a competitive swimmer for around 12 years, first swimming for Nottingham Swim Club, then, aged 11, I joined Portland. During my time at Portland I competed in galas and club meets, gaining several county times and training for midland times, as well as setting new Club records, several of which still stand. Not only was I a swimmer for Portland, I used to lifeguard sessions and helped out with coaching when needed. 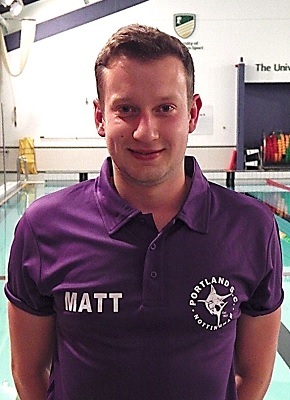 Aged 18 I left Portland to study Sport & Exercise Science at University and graduated in July 2015. I also gained my level 1 in teaching and coaching aquatics whilst at university. Although I no longer swim competitively, I still wished to be involved with sport by offering the Club the knowledge I have gained from University as well as my experience as a competitive swimmer. I want to push swimmers to their full potential by regularly beating PBs and help as many of the swimmers as possible to reach county times and beyond …. and hopefully see my Club records get beaten!! Not only do I want the best for the swimmers, but as a coach I want to become better through attending as many courses as possible.